William Memlon Williams was born on November 21, 1934 in St. Louis, Missouri to the late William and Annie Elizabeth Williams. The eldest of five children, he was raised in the big city of New York where he was afforded countless opportunities. 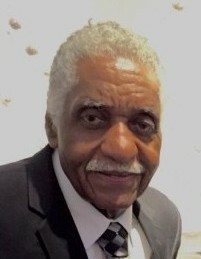 After graduating from the New York City Public School System, he received vocational training as a professional welder which qualified him for employment with the New York City Transit Authority until his retirement in 1990. As a young man William accompanied his mother, a church soloist, to her performances at gospel concerts around New York City. Doing so enabled him to develop his talent as a singer. He dedicated his life to Christ at Loyal Baptist Church in Bronx, New York. On February 4, 1956 he married the love of his life, Margaret S. Fort. From this union five children were born. In the mid-1960 ' s with his young family in tow, he attended Epworth United Methodist Church (Bronx, New York). In 1968 he moved his family to Roosevelt, Long Island where they attended Second Baptist Church (Rockville Centre, NY). In 1991 William and Margaret relocated to Macon, Georgia where they attended St. Paul' s AME Church. William faithfully served in ministry for many years as a choir member, Deacon, Trustee, and Superintendent of Sunday School. After their final retirement they relocated to Maryland and served at Clearview Baptist Church in Randallstown and The People's Community Baptist Church in Silver Spring. William was a man of great character and morality. His love for his family was immeasurable and unsurpassed. These characteristics seeped into his love for all he met. He was a father figure to countless children. His support of them was evident by his attendance at school functions, graduations, weddings, promotions, and family reunions. He was enjoyed, admired, and cherished by all who knew him. He leaves to cherish his memory his wife of 63 years, Margaret Williams; his five children and their spouses, Memlon Williams (Sandra), Karen Robertson (Isidor), William Williams (Monica), Katherine Underwood (Willie) and Joseph Williams, Sr. (Gigi); ten grandchildren; twelve great-grandchildren; brothers and sisters-in-law Clinton (Diane). Bernard (Gloria) Fort. Valerie Gibbs and Ramona Fort; one godson, and a host of nieces, nephews, and countless special friends and other family members. He was preceded in death by his siblings-Nelson Williams, James Mitchell, Ronald Williams, and Joan Davis-Welch.